The Sunda Strait between the islands of Java and Sumatra connects the Java Sea to the Indian Ocean. At least 43 people have been killed and 584 injured after a tsunami hit the coast around Indonesia’s Sunda Strait, officials said. The country’s disaster management agency says two people are missing, and hundreds of buildings were damaged. Quoting officials, the BBC reported on Sunday that the possible cause of the tsunami was undersea landslides after the Krakatoa volcano erupted. The deaths were reported in the Pandeglang, South Lampung and Serang regions. 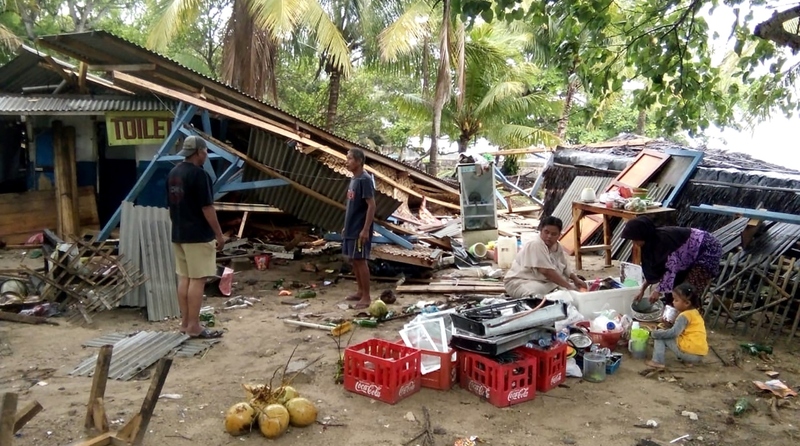 The disaster management agency warned that the death toll is likely to rise further, adding that high seas as a result of the full moon may also have contributed to the strength of the waves. Oystein Lund Andersen, Norwegian volcano photographer, at Anyer Beach in West Java, said: “I was on the beach. I was alone, my family were sleeping in a room. “I was trying to photograph the erupting Krakatoa volcano. Earlier in the evening, there was quite heavy eruption activity. But just prior to the waves hitting the beach, there was no activity at all. It was just dark out there,” he told BBC. “And suddenly I saw this wave coming, and I had to run. There were two waves. The first wave wasn’t that strong – I could run from it,” he said. Footage posted by the spokesman of disaster agency showed the aftermath of the tsunami, with flooded streets and an overturned car. He had earlier posted footage of water rushing in and local residents trying to flee in panic. Emergency officials are now investigating whether the tsunami was caused by Anak Krakatoa, a volcanic island in the Sunda Strait. Volcanologist Jess Phoenix told the BBC that when volcanoes erupt, hot magma pushes underground and can displace and break through colder rock. This can trigger a landslide. But because part of Krakatoa is underwater, she said “instead of just causing a landslide, you get an undersea landslide which pushes water as it moves.” This can then cause a tsunami. On 26 December 2004, a series of huge waves triggered by a powerful earthquake in the Indian Ocean killed about 228,000 people in 14 countries, including Indonesia.